Problem: The homeowner required improved access to their crawl space. Solution: We installed a steel window well, as part of the crawl space access is below grade and added an EverLast crawl space access door which seals tightly for an ideal crawl space environment. Looking for an estimate on repair of basement for a property I wish to sell. Got water coming into basement. I believe I have a crack or its coming in around large sewer pipe that goes through the wall. Just wondering about getting my mothers basement waterproofed so looking for an estimate. It has been leaking on the back wall when it rains. Please call or text message the number provided so I can set up an appointment or do you only need measurements. We are preparing for a basement renovation to make a bedroom out of an unfinished basement and need insulation for this space. We also have a crawlspace where the walls need insulating. My house needs to be jacked up to a level position and new support beams need to be installed. There's no access point to do this. 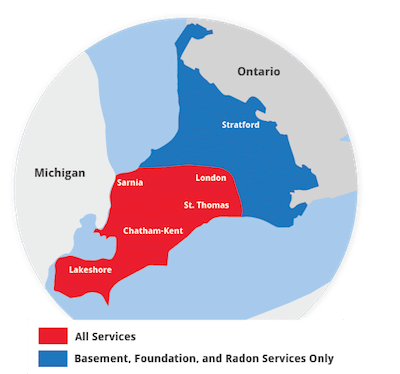 Radon Mitigation. Seems like a pretty simple procedure to be done in my basement. I have tiling in the inside of the house underneath the concrete that leads back to the sump pump room. We are planning to replace our back deck this summer and have a few minor cracks in our block foundation (open/exposed in the basement). Our house was built in 1980 and the foundation was never sealed. We are looking to get the back (26ft in length) of our home dug and waterproofed/sealed before we proceed with putting up a new deck. We are looking for a quote on this work. Thank you! "The Advanced Basement Systems team has excellent people in..."
"Very impressed with the customer service and..."
"excellence began at first contact. Very friendly and..."
Great people are working for you! Very satisfied with job done. Inspector was very good and the installation team was very professional. Chose you from your reputation. We not only adhere to the highest industry standards, we strive to be the industry leader in the home improvement related services we provide. We also use state-of-the-art products and technology which are designed to fix your home. We are the authorized Basement Systems dealer in Blenheim, ON. We installed our super reliable and heavy duty TripleSafe™ Sump Pump System. Close up of the I-beams which are secured to the joists above the affected wall. Our team installed The PowerBrace™ Wall Repair System on the bowing wall. I'd like to get an idea of how much it will cost to wrap my house. I have a couple of cracks in my foundation walls, one of them just started leaking. I need to get it repaired. The house was built in 1902 and has a rubble stone foundation. There is a section on the east wall where there is an obvious leak into the basement and also a problem with loose bricks at ground level on the south west corner of the house. You can reach me at the above number during the day or at at night. I can be available almost anytime to show you the areas of concern. Poor supports in crawl space. Crumbling exterior foundation wall in some sport. Issues with the pouch, but want to remove and replace. Looking for a quote and some advise. My husband and I have a small cottage in Shrewsbury on a block crawl space. Some blocks have shifted and there is water collecting in the crawl space. We would be interested in either raising the building and replacing the foundation or doing whatever repairs would be necessary to eliminate the water. I would like the cost of a second battery and splitter for my back system that you've already installed. Just moved in and looking to secure basement before refinishing. There is a sump pump and back up system in place. Would like your advice on waterproofing our basement.